Magicvoice: Jackie Chan: My Stunts is the companion piece to the less interesting Jackie Chan: My Story. My Stunts begins by taking the viewer on a nostalgic tour of some of Chan's most famous action scenes. We're taken to the locations of his most accomplished film, Police Story, and reminded of how amazing and dangerous the stunts in that film were. We are then treated to an inside look at the lab where Chan and his celebrated stunt team come up with their ideas for new fight sequences. Chan takes us step-by-step through precise demonstrations of pole fighting and wire techniques. All the while, his enthusiasm for his work is palpable; even after all these years one gets the sense that his work is his whole life. 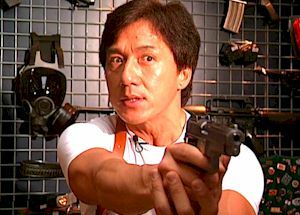 Chan's perfectionist ways are illustrated to even greater effect in the behind the scenes clips from Who Am I (1998). During the filming of a rooftop fight Chan becomes frustrated with the performance of a fighter who is a real martial artist and not a movie actor. After several failed takes and a lot of patience, Chan finally replaces him with one of his own team members to get the results he wants. It's a very interesting peek at what it must be like to work with the man.